LOOKING FOR FAMILY HOLIDAYS TO BEAT THE CREDIT CRUNCH? With high food and fuel prices taking their toll on the family budget along with the weak pound, there’s no need to strike holidays off the list for the year. Head for one of France’s best kept secrets, the mountain sports playground and historic thermal spa town of Cauterets. Here you can discover some of the country’s most breathtaking views, finest walks and treks, plus a less crowded and more chilled out skiing experience, all at cheaper prices than most other European resorts. With reported price increases of more than 50 per cent awaiting families booking half term ski holidays (1 ) for February 2009 in popular ski resorts, Cauterets offers a very different ski experience to The Alps and other more commercial resorts for less money. 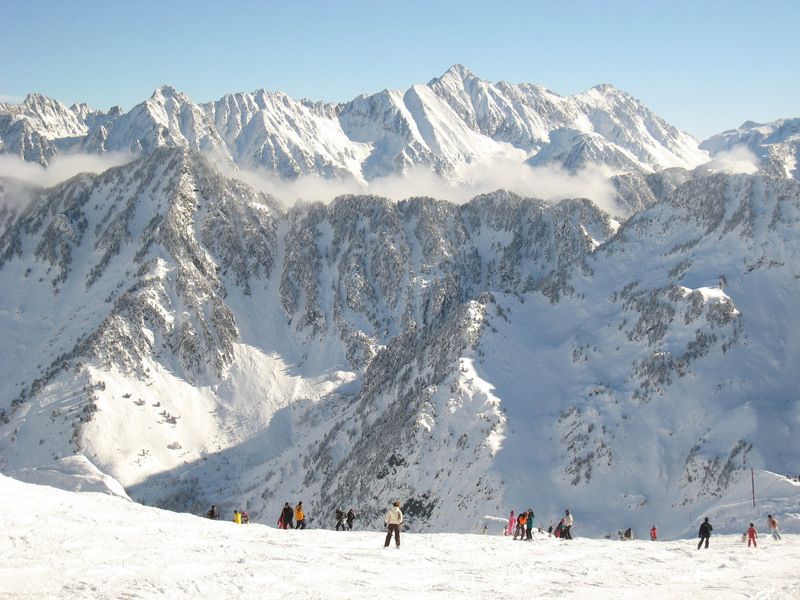 With uncrowded slopes, a genuine friendly French feel to the town and ‘more for your money’ prices, it is the ideal location for a great value skiing holiday. You can benefit from special deals on ski passes such as the family 6 day pass (2 adults and 2 children aged 6 – 18 years) at 440€ (2). Whilst the ski area of the Trois Vallees is far larger than Cauterets, so is the cost of the family 6 day ski pass at 720€. Recent investment into Cauterets has given the resort a high speed 8 man telecabine linking the town centre with the slopes as well as more snow making facilities. 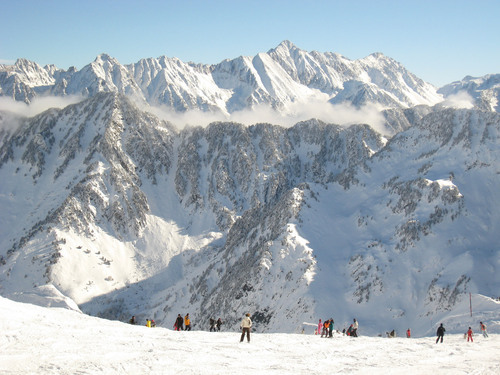 The main ski area is based in the Cirque du Lys, a large east facing bowl which retains good snow conditions far longer than the majority of the other surrounding resorts. 15 minutes away is Pont d’Espagne, a beautiful setting for cross country skiing, winding its way through the serene national park. In addition there are off-piste and ski touring options with guides for the more adventurous. With budget airline Ryanair flying from Stansted to Pau airport (Pau is just over an hours easy drive to Cauterets) and Easyjet flying from Gatwick to Toulouse airport (Toulouse is two hours from Cauterets), you can shop around for flights as cheap as €60 return per person in the low season before and after February (3). Other nearby airports are Carcassonne and Biarritz, also served by budget airlines. Through spring, summer and autumn, walking and trekking holidays are a great idea for budget breaks as all you need to pay for is travel, accommodation and food – the activity itself costs nothing. Whether you want a 20 minute gentle stroll up to a spectacular waterfall or if you prefer trekking over vast snow capped mountain tops bordering France and Spain you can discover rewarding walks for all ages and abilities in Cauterets with more than 100 marked footpaths around the town and in the National Park including the famous GR10 and HRP. There is a wide and expanding range of accommodation to suit all tastes and especially tight budgets in Cauterets. With supermarkets, restaurants, good shops and an excellent covered market, self catering is a good value option. Try Mulcares in the Pyrenees (www.mulcares.com) run by an English family offering affordable stylish apartments based in the old town quarter with prices starting from €400 for a fully equipped family apartment for the week (4). Cauterets’ restaurants offer enough different cuisines to suit everybody’s tastes. Set menus are popular and even in the more expensive restaurants you can always find a good value meal with three course set menus starting from around €17. Other options for accommodation and restaurants can be found on the official tourist office website www.cauterets.com. This press release was distributed by ResponseSource Press Release Wire on behalf of Mulcares in the Pyrenees in the following categories: Leisure & Hobbies, Women's Interest & Beauty, Travel, for more information visit https://pressreleasewire.responsesource.com/about.